Deciduous tree with many varieties (over 700 cultivars) that range from 15 – 45 ft. in height. Crown can be very busy and produce many twigs. 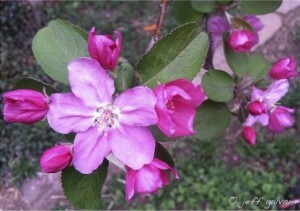 Flowers in the early spring with white or pink blooms. Often grown as an ornamental tree. The small fruits, usually red in color, are often very sour and used for canning and the making of jams. Common problems Crabapples experience are: Apple Scab, Fire Blight, Rust, Powdery Mildew, Apple Scab, Canker Diseases, Scale, Eastern Tent Caterpillars, Leaf Defoliators, insect borers, and aphids.